For most overseas Filipinos, it's not always possible to take time off at work to attend religious events and practice the faith. Also, churches and places of worship are sometimes few and far between where the overseas Filipinos stay - such as in the Middle East. With the Holy Week approaching, plan to spend a few hours to relive the Catholic tradition - right on your computer. With overseas Filipinos in mind and other people who can't otherwise be present at Mass due to circumstance (the sick), the Catholic Bishops Conference of the Philippines makes possible an online Visita Iglesia. Be awed by grand Philippine Churches - from Batanes to Marinduque - through video walk-throughs and virtual tours. You can even perform a "Way of the Cross", complete with recorded prayers. You can also access YouTube-recorded Lenten sermons to reflect on this Holy Week. Meanwhile, back in Manila, the Society of St. Paul, who also run TV Maria, hold (and upload) Catholic Masses for a YouTube audience. 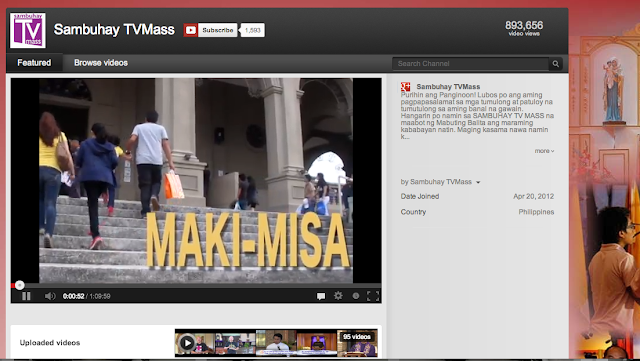 Watch the Sambuhay TV mass from this YouTube channel. culture where everything will be new. my loved ones when I want to. Share with me the same faith. of my family and lvoed ones. I have to leave to do God's will. we are far from one another. Mary be our Mother, too.